Want cold-weather apparel at amazingly hot prices? Need short sleeves for your tropical winter getaway? Be sure to check out all of our styles including heavy sweatshirts, T-shirts, baseball caps, and more so you can sport your drum corps pride during any season of the year. Shop all DCI apparel now! In celebration of the holidays, prices on the entire collection of Drum Corps International DVDs have been slashed. Select DVDs are only $19, World Championship DVDs from 2000 to 2007 are now only $39, and the coveted Legacy Collection DVDs (1974-1999) are at their lowest price ever offered. Can't decide on any year in particular? For the very first time, DCI has bundled its entire World Championship DVD collection from 1974 to 2008 into one package. Valued at more than $1,500, this landmark 60 DVD set features more than 400 of the greatest performances of all time, and it can be yours for a VERY limited time for just $699. Shop all DCI DVDs now! DCI's year-end blowout on 2008 World Championship gear puts all of your favorite collectibles into neat and tidy packages at incredibly low prices. 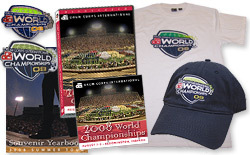 Among more than 15 different combos, add a Championship pin, patch, hat and T-shirt to your 2008 CD order for a savings of nearly $50, or add a World add a Championships T-shirt to your 2008 DVD order for only $1! Shop all '08 World Championship bundles now!